Although I haven’t mentioned it before, in order to earn some extra money, usually for crafts, or fun money for the family, I babysit during the day. Even though I love my boys, and wouldn’t trade a single one, I do consider myself extremely blessed that during the week everyday is now filled with a splash of pink. The beautiful baby girl I watch has given me a wonderful opportunity to experiment with all things girly, which up until 9 months ago was foreign territory for me. I can’t believe how much she’s grown in the 10 months I’ve had her in my life. That being said, her 1st birthday is approaching fast, and with a ‘Princess’ theme for THE Birthday Princess, I knew these necklaces would make the perfect party favors for her special day. They couldn’t have been any easier, and I thought the results were just adorable. Each necklace represents a different Disney Princess, and in order they are: Snow White, Rapunzel, Merida, Cinderelle, Tianna, Aurora, and Ariel. I love the simplicity and the how the different colors capture the essence of each character’s unique color-scheme. I opted out of making necklaces representing Mulan, Pocahontas, Jasmine, and Belle, but if those are your favorite Princesses, I have listed below the ideal colors to create necklaces for them. Thread wooden beads onto skewer. I found up to four would work and allow enough room for drying without sticking to one another. Paint beads desired color. 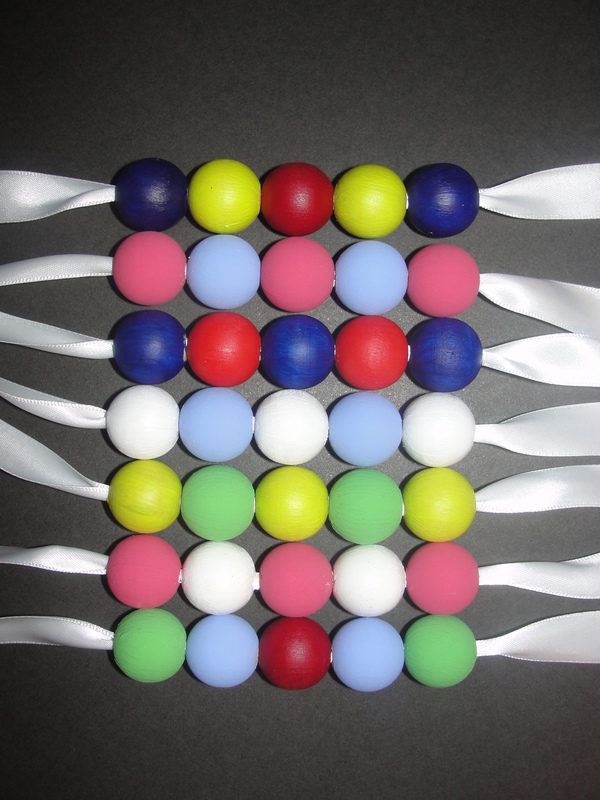 It helps if you use only one color on beads on the same skewer. While most colors only require one coat, lighter ones such as yellow and white, may require two coats. Set skewer on top of a bowl, with beads over the center of the bowl, and allow beads to dry. Measure ribbon around neck and add 2 inches to the desired length. Cut. Repeat for the desired number of necklaces. To prevent fraying, use a match or candle, and very carefully melt each end of the ribbon. When the beads are dry, thread them onto the ribbon into the order shown above.